The purpose of our talks and displays is to showcase a number of our animals and be able to give visitors much more information about them than is usually possible. These sessions take place throughout the day and are given by our keepers. 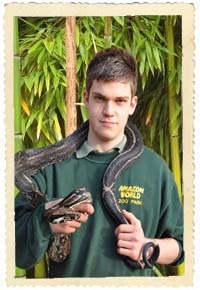 Normally an animal from each of the major families: Mammals, Birds and Reptiles are taken into our display area. Occasionally due to cold temperatures we may not be able to bring out a Reptile but this will be explained at the beginning of the session. The keepers will tell you lots of information about the species and the individual (all of our animals have names and their own unique personality). They will also ask for any questions you may have about them and they will try to answer the best they can. Some of these animals you will meet also visit local island schools to help educate our children about the rainforest and animals that live with in it.